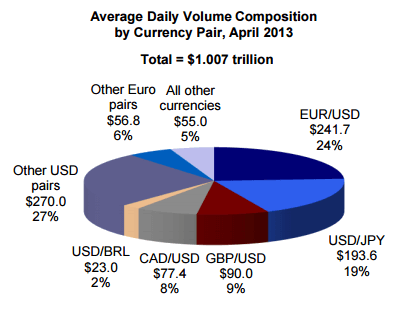 Foreign currency trading, also known as the FX exchange market, is the world's largest commercial arena, with associated market liquidity of over $5 trillion trading daily. The variety and ease of initiating trades motivates both professionals hedging billion dollar positions and individuals leveraging pocket money Both risk avoidance and speculation motivate usage of this marketplace exchange. In every Forex exchange transaction, you are simultaneously buying one currency and selling another. Prices are generally quoted in basis points or "pips," the lowest possible change in a currency's price. Most of these currency pairs will be priced out to four decimal places. . The fraction numerator is referred to as the "Base currency", while the denominator is the "Quote currency." Are There Risks Involved With Foreign Exchange Currency Trading? New traders must understand the risk associated with margin trading. Successful traders understand that the leverage provided by outsized margins — up to 400:1 for CFDs — is best used to diversify a portfolio, thereby minimizing the risk of any single trade. Beginners should limit their loss exposure on any specific position to a maximum 2% of their portfolio. With experience, this threshold can be raised to 5%. Foreign currency trading, like any sustained market-based endeavor, requires mental discipline and agility. Open positions require constant monitoring. When you have "skin in the game", you can't be "out to lunch." Furthermore, markets react dynamically to the entire spectrum of fundamental news, from changes in interest rates to the ephemeral "consensus" of key players. And the individual trader must be sufficiently sensitive and pro-active to them all. A good strategy for foreign currency trading strategy includes technical analysis, the imputation of tradable information in the past price movements of financial instruments. While professionals vary on the interpretation, significance and profundity of various price movement patterns, the importance of this approach in price determination cannot be ignored. One potentially successful forex trading strategy is to buy breakouts to the upside from a trading range and to sell breakouts to the downside. Following the crowd in financial markets has been a successful investment strategy over the long run, since asset classes that start to go up, continue going up more than they go down, and vice versa, confirming investors' propensity to chase performance and to find comfort in the herd. Each market instrument has its own toolset to help you automate implementation of your decision and full employment of these options is advised. For example, most instruments allow for stop orders (for purposes of loss limitation and profit guarantee), an essential tool in anyone's trading arsenal.